The Republic de Panamá has been home to people from all over the world since the Panama Canal opened in 1914. The trip here is much easier now and Europeans and Americans continue to migrate here. But now instead of young men looking for work or to make their fortunes, the new immigrants are the newly retired Baby Boomers and others who have found that they can now have a little adventure in their lives. Not only does their money go farther in Panama but there are so many activities to keep them occupied. Panamá is accustomed to foreigners and English has become a second language for most of the people. The currency is the Balboa coin and the US Dollar which eliminates any high math that would be required to figure out the price of a gallon of milk. The cost of living is far lower than in the United States or Europe, food, housing, medical care and domestic help all are very affordable – even the $1.00 menu at McDonalds is only .89 cents in Panama City. The tax benefits of living as Ex-Patriots (Ex-Pats) in Panama is historically renowned as the one of the best is the world, this has been the driving factor for many retirees and self-employed people. When you combine all of these facts together with one of the most pristine rain forests and vast expanses of agricultural land you have a beautiful and exciting environment to explore. Depending on where you go in Panamá you will see many different faces. In Panama City you will find many Americans and Europeans as this large city has been the focus of international banking and trade for over 100 years. The American Chamber of Commerce and Industry of Panama (AMCHAM) was created on October 31, 1979, by a handful of business people who felt that the organization could be an important voice in promoting business ideas in Panama. Periodic market studies and reports covering topics such as local legislation, have all provided critical data about the Panamanian market for business people here and the head offices of American businesses in the United States. Because of this important organization you will find many American business men and women living full time in Panama City. As you venture out to the interior of Panama you will find a wind range of people, everyone from backpacking Europeans in Bocas del Toro to retired Baby Boomers in the spring-like area of Boquete. One feature all these people have in common is a sense of adventure and the need to experience life to the fullest. The economy in Panama has become largely service based, with banking, tourism, and commerce all playing important roles. Only about a quarter of the land is used for agriculture. On the upland savannas cattle are grazed and subsistence crops such as rice, sugarcane, cocoa, and coffee are grown. Bananas are grown on the Pacific coast. The country has various light industries. The Colón Free Zone, established in 1953, is a center for foreign investment in manufacturing. Banana are the leading export, followed by shrimp and fish products, sugar, clothing, and coffee. The Republic de Panama is a constitutional democracy with a President and Vice President elected on the same ticket by popular vote for five-year terms, they are eligible for two more terms. The National Assembly is also elected by popular vote to serve five-year terms. There are seven political parties: Democratic Change or CD; Democratic Revolutionary Party or PRD; Liberal Party or PLN; Nationalist Republican Liberal Movement or MOLIRENA; Panamenista Party or PA; Patriotic Union Party or PUP; Popular Party or PP; Solidarity Party or PS. The legal system is based on the Civil Law system and has as Supreme Court of Justice with nine judges appointed for 10-year terms. The weather in most cities in Panama is tropical which can be hot and humid. You will find that Panama City can be very hot, but all of the beaches on the Pacific and the Caribbean will have a tropical breeze to help keep the humidity down. 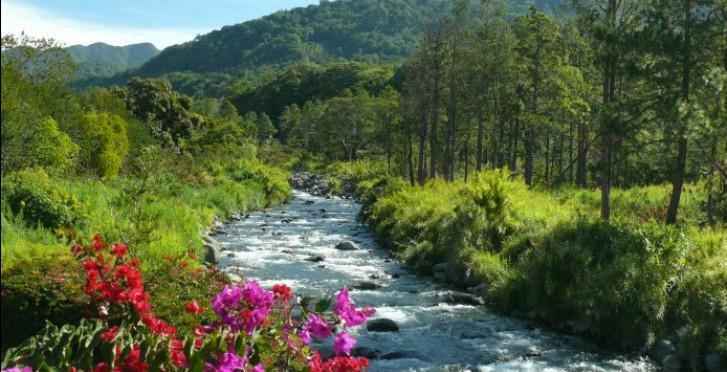 However if you venture into the Chiriqui Highlands you will find a spring-like weather pattern that is consistently between 70 and 85 degrees year round with very low humidity. You can also find this same weather about an hour outside of Panama City in the town of El Valle. As in most Latin American countries the sport of choice in Panama is football (or soccer to the Americans). The team, La Marea Roja "The Red Tide", is a member of the Federación Panameña de Fútbol and is currently undergoing a resurgence. Nowadays, under the direction of former Costa Rica head coach Alexandre Guimaraes and with some skilful players from MLS, Colombian, Mexican, Portuguese, Bulgarian and Spanish leagues, Panama is considered to be one of the best teams in CONCACAF ranking 4th among CONCACAF teams according to the monthly FIFA World Rankings. Baseball is also a very popular sport in Panama City. Panama has a national team and you may have seen them in the MLB Baseball World Classic. There have been over 42 professional major league players that have come from Panama. This could be a very long list. Everywhere you go in Panama you will find something that has drawn a group of people there. From the big city of Panama City to the small archipelago of Bocas del Toro there are people who have emigrated there because of the particular attractiveness of the area. Panama City – For people that love all the conveniences of the big city. The city is great for good shopping, a variety of restaurants and socializing. Big city apartments and a stunning view of the bay of Panama gives this city an advantage over most cities in the world. El Valle – Located approximately 1.5 hours outside of Panama City you have all the benefits of country living in a mountainous area that has spring-like weather, however you are only a few miles from the city and all the benefits it provides. Coronado – Beach front, Pacific Ocean properties. Very hot and humid but a nice white sandy beach with beautiful water and few people. Contadora – Luxury island living and only a 20 minute flight to Panama City. Home to the TV show “Survivor” for two seasons this is a garden paradise with white sand and blue waters. Chitre – Located in the Azuero Peninsula approximately 4 hours from Panama City. The Azuero is still home to some of Panama’s oldest traditions and cultures. Primarily a ranching area it is also home to beautiful beaches, terrific surfing and world class fishing. Bocas del Toro – This small group of islands is located in the Caribbean Ocean on the border of Costa Rica and Panama. Having been farmed by Chiquita Banana for over 50 years this area is now home to a booming “Gringo” enclave. Hot and steamy like all tropical islands this stunning archipelago is still raw and attracts back packers looking for a bit of the old world. Life here is a little harder than anywhere else in Panama, not much shopping, limited food choices and few people but for some that is paradise. David – Considered to be the second largest city in Panama, David is the last big city on the Pan-American Highway before you reach Costa Rica. Located only a few minutes from the Pacific Ocean waterways this city has a lot to offer. People from all over the Chiriqui Provence come to David for clothes shopping in their bustling downtown area, a large farmers market and of course everyone’s favorite – PriceSmart. David is hot and very humid but in the outskirts of town you will find friendly farmers and ranchers and a very peaceful way of life. Volcan – With a much higher elevation than Boquete, Volcan and Cerro Punto have attracted Europeans since the early 1900s. With a strong agriculture economy, this part of Panamá has remained virtually untouched by the immigration of hordes of Ex-Pats. You can still find sleepy hollows in this beautiful cloud forest region. As we discussed earlier the Panamanian currency consists of the Balboa coin in the same denominations as the US coin, and the US dollar. Local banks can exchange money from other countries. You will not be able to use Traveler’s Checks here as most businesses do not take them, however the VISA and MasterCard systems are in most stores. Local checks are sometimes accepted but is not recommended if the business does not know you. This is where Panama really shines. Many people around the world have gone to the United States when they needed state-of-the-art medical care…and they’ve paid a high price for it. This has given rise to the term “Medical Tourism” and it has become big business. What began as a consulting project has given birth to an affiliation agreement with Hospital Punta Pacifica that nows offers state-of-the-art diagnostic and clinical care to patients, as well as educational and training opportunities for those who care for them. Hospital Punta Pacifica accepts patients from Panamá and all over Latin America. With many doctors educated and trained in the United States there are many facilities in Panamá that offer first rate health care at a fraction of the cost. Health insurance is widely available for as low at $100.00 per month a 70-79 year old individual can receive a health care plan from one of the local hospitals. Individual rates may vary but this rate is from a widely used plan in Chiriqui. If you are considering a move to Boquete - then this book is a MUST!